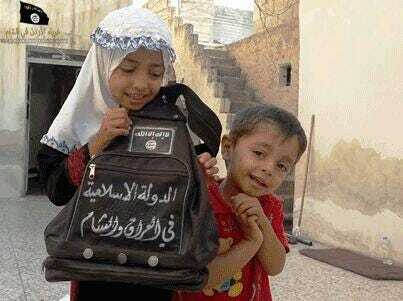 As the U.S. mulls strikes, Al Qaeda is concerned kids have the right materials for school. The Islamic State of Iraq has been pouring over the Syrian border for some time now in an attempt to bolster Jabhat al-Nusra and topple the Bashar Al-Assad regime. They're best known for fighting the U.S. Marines in Iraq's western-most Al-Anbar province during the Iraq War. In attempt to rebrand themselves, they've even begun handing out Teletubbies and toys. Their soft-side approach in Syria mimics that of a letter written by the head of Al Qaeda in the Arabic Peninsula in 2012, Nasser al-Wahishi. The letter — sent to Qaeda's leaders and a copy of which Associated Press reporters found in Mali — encouraged water works and electricity projects, rather than Islamic summary maimings. It even gave advice on how to best conduct trash pick-ups. "Try to win them over through the conveniences of life, it will make them sympathize with us and make them feel that their fate is tied to ours," wrote Wahishi. After its failure in Iraq, say experts who were shown the correspondence, the terror network realized that it is not enough to win territory: They must also learn to govern it if they hope to hold it.